Dr. Shaheem in Fuvahmulah City. Running mate of the President Abdulla Yameen Abdul Gayomm in the upcoming Presidential Election, Dr. Mohamed Shaheem Ali Saeed, has said that since President Yameen was elected, attempts have been made from in and outside the country to overthrow the presidency and those attempts were made with foreign influences behind them. 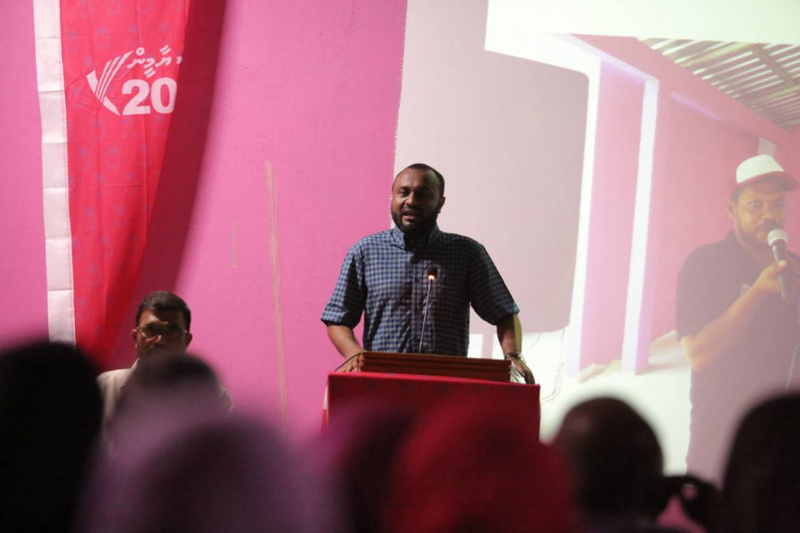 Talking to the people of Dhoodigan ward on his campaign visit to Fuvahmulah City last night, Dr. Shaheem said that it wasn't Maldivians who attempted to overthrow the government of President Yameen. He said that when President Yameen took over as President, the country was isolated from the Arab-Islamic world. Dr. Shaheem noted that the government of President Yameen gives special attention to the youth, women and people with special needs and noted that the government works to bring the sidelined youth back into the society and provides the opportunity for higher education. He said that there are women in many prominent positions of the government and it shows that government efforts in the empowerment of women. And the government has also provided employment opportunities for people with disabilities. The President's running mate said that the biggest challenge in President Yameen's political life has been the events of 1 February and it showed his courage to the nation. Responding to the oppositions, Dr. Shaheem said that votes does not have to be inappropriate to win the election and President Yameen has already won the election.